Can you have a treat that is also nutritious? Absolutely. There is no reason why you need to chose a food that lacks nutrients to get a great treat. 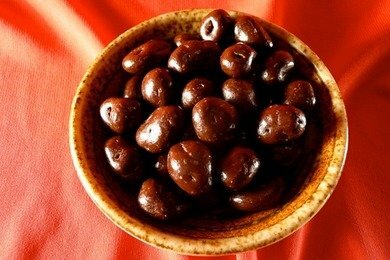 Dark chocolate covered raisins combines two really nutritious foods: Raisins and Dark Chocolate. Basically, you have dried grapes (all the benefits of red wine) and roasted and processed beans (also a plant product). The key to getting nutritious chocolate covered raisins is to buy high quality ones. The ones covered in milk chocolate are okay, but they don't have any of the health benefits of dark chocolate. How many should I eat? Well, if you are on a diet, you should stick to 10. If you don't need to watch your weight, measure out as many as you think you want, and then put the bag away. Remember, it is extremely difficult to monitor how much you eat out of a bag. These are a great snack for kids because you get to give them chocolate and something healthy at the same time. Also, you can control portion size and use the number as a way to learn how to count, and reward them. For example, you could say, "If you eat all your peas, you can have 10 chocolate covered raisins." and then the child can help you count. Please give me weight watchers points for this! what about the acai berries with dark chocolate?